Label Synth-Me is happy to introduce the second release by the group Mea Vita "Fevral". The trio of fascinating girls - Felis, Lila and Winter joined to run a project in 2008. Darkwave and neoclassic were chosen as the most appropriate styles to express human feelings. Projecting emotions onto the present-day reality, Mea Vita narrates simple stories of nontrivial occurrences. While listening Fevral one can find notes of sadness and love, familiar to everybody. Original versions are supplemented with remixes by Digital Machine, Ariu Kara, Dree My Weird, Ainoma, Last Phase and Aggressive Remover. 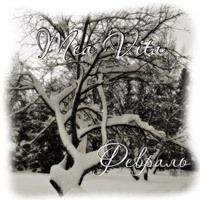 Dissolve in the atmosphere of winter evening with Mea Vita. Synth ur life!